I don't even need to tell you what I think about this picture that was posted by comedian Kevin Hart. I would just rather hear what you have to say because with all this Trayvon Martin stuff going on I don't have time nor the brain cells to dedicate to this foolishness. As far as I'm concerned, he's just another person throwing black women under the bus and the only reason I'm reporting on it is because of the uproar it has caused on the internet. I completely understand the sentiment. I remember back in college, I met two women on the same day, one Black the other white. I struck up conversations with both and asked for their numbers. The Black woman's number was fake while the while woman's number was real. I feel that a great many Black women act as if half the race has its stuff together (them) and the other half are the problem (us). I don't deny there are a lot of scandalous Black men in the world, but to act as if there are no scandalous Black women plays in to the hands of those who would continue to fracture relations between Black men and women. white men routinely promote images of themselves with Black women who are happy and successful (when not with a Black man) and constantly arguing when they are with a Black man. 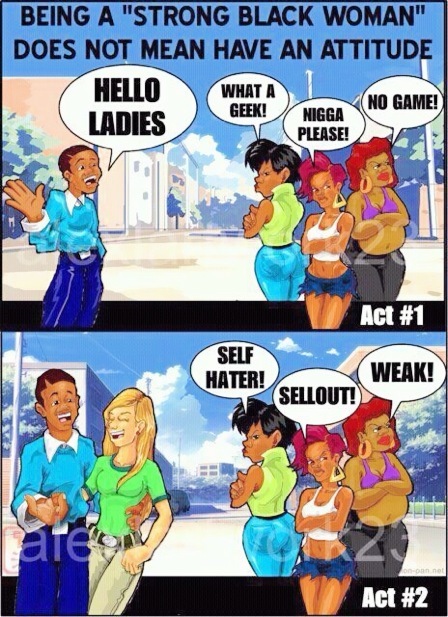 Black women are so busy eating up this hype because it reinforces what they want to believe that they miss out on the positive Black men that could truly make them happy. Instead of constantly picking the same type of guy and wondering why they're always sad and hurt, Black women should sit down and maturely figure out what it is they truly want; the odds are there is a Black man right in front of you ready to work with you to make you both happy. The issue is lumping black women into one group based on a few experiences. Stereotypes are not unfounded but they are not true across the board and there is this ugly image of black women out there that is steadily perpetuated. Personally, I do not ever feel slighted when I hear or read statements like these. I know what applies to me and what doesn't. Quite frankly, it is not my issue to correct. If a person doesn't want to take the time to know a person individually before drawing conclusions, that is not my problem. So on one hand, I wish that black women stop getting so angry about comments like this. On the other hand, for our own self-respect we cannot accept the mess that is thrown our way. The mudslinging goes both ways. Black women have ragged on black men and lumped them all in the same category. My message is to deal with people individually. A handful of experiences cannot be generalized to an entire group. Sistas get pissed when Men start telling the truth And calling them on their B.S. But, they continue with the same B.S Despite already knowing what the problem is. Dont get mad at Men for calling you out. FIX IT!!!! !